For a host of reasons, your AlmostItalian.com team of two is far behind the proverbial eight-ball this year. We just haven’t been posting as much thanks to the diabolical gremlins messing up our DSL service. We can think of more than a few Sicilian curses to hurl at the telecom companies exploiting the hapless, underpaid “customer service” agents in distant call centers, places where we suspect one can’t even find the solace of a good dish of pasta at the end of the day. But hey– it’s Christmas– or more correctly– la vigilia, Christmas Eve, and we should be more positive and offer you just a little something to take the edge off. Here’s a little Polpo Marinato. 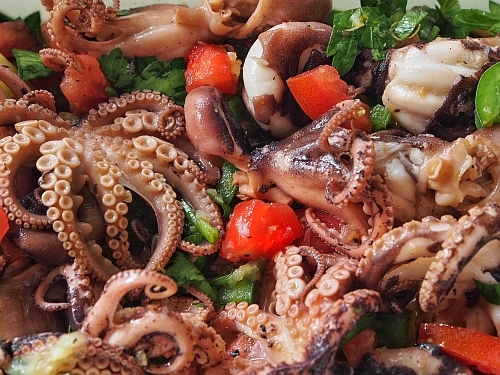 We made this last night and the gently cooked “baby” octopus have been marinating in lemon, olive oil, capers fresh Florida tomatoes, peppers, and parsley. The salad will stay in the fridge till it’s time to lift a glass and wish everyone Buon Natale later this evening. We’ll give you the recipe in a few days. Subscribe and you’ll be notified as soon as we do. No SPAM, just good cheer and delicious food! This entry was posted in Antipasti on December 24, 2015 by Skip.